Auditor General, Deodat Sharma handed over two audit reports to Speaker of the National Assembly, Dr. Barton Scotland yesterday. In addition to the yearly report of the nation’s spending, Sharma also gave Dr. Scotland the fourth Performance Report on “The Construction of the New Access Road to The Cheddi Jagan International Airport”. A simple handing over ceremony took place at the Public Buildings Committee Room Two. At that forum, Dr. Scotland was keen to note that the handing over should not be viewed as routine. He said that it is an indispensible feature for transparency in Guyana. The Speaker pointed out that the report was being laid in a timely manner. Dr. Scotland said that parliament is in recess and will remain so until October 10. He said that after Parliament convenes, the report will be laid in the House and will thereafter become a public document. Sharma noted that the 2016 report is his 13th report as Auditor General. He said, too, that the handing over of that report marks the seventh consecutive occasion that the Audit Office has been submitting the report of the Auditor General on the Public Accounts of Guyana to the Speaker of the National Assembly by its statutory deadline of September 30, following the close of the fiscal year. 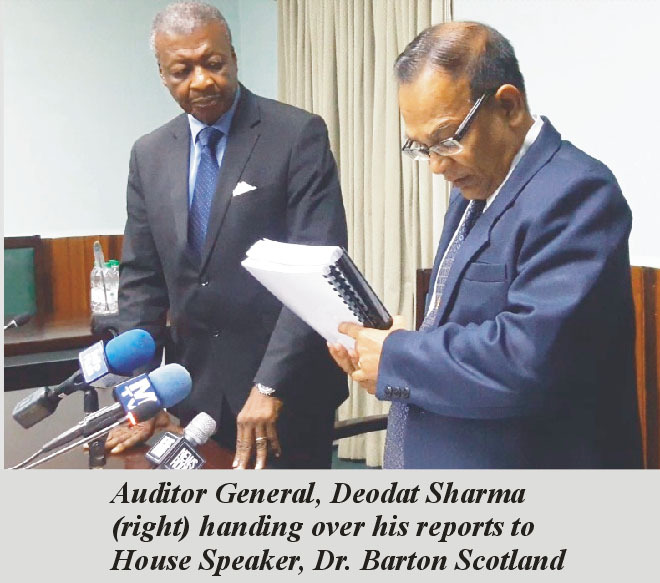 Sharma said that prior to his assuming the Auditor General’s mantel; the Audit Office was in a state, whereby its systems and processes were done primarily by manual means. Its technological infrastructure consisted of a few computers; whilst, the majority of its staff was not proficient in the use of modern technology. Sharma said that communication mechanisms were also poor, and the Office’s visibility to certain stakeholders was non-existent. He said that among other unsatisfactory situations, this state of affairs led to untimely reporting and huge backlog of audits, especially those for the Statutory Bodies. Sharma then boasted the Office transformation. He said that it was due in large part to the benefits derived from four Technical Cooperation Agreements signed between the Inter-American Development Bank and the Government of Guyana that spanned the period 2003 to 2017. Sharma said that the Office was able to modernise its organisational and human resource management function, which included the provision of capacity building initiatives to increase managerial capabilities. In addition, Sharma said that three new units were established with specific responsibilities for performance auditing, fraud investigations and quality assurance. Sharma said that the Office also incorporated new technology that strengthened its infrastructure, capacity and capabilities. This resulted in better communication between Sub-Offices and fostered the sharing of information in an efficient and cost effective manner. The Auditor General said that procedures, professional practices and technical standards were improved in keeping with international standards, including those of the International Organisation of Supreme Audit Institutions (INTOSAI). More specifically, he said that the risk based approach to auditing was implemented; whilst, the Interactive Data Extraction and Analysis (IDEA) software, which is a computer assisted auditing tool (CAAT) was acquired to support the audit process. In addition, audit procedures manuals were developed and updated over time to ensure compliance with up-to-date international standards and practices. Sharma said that in keeping with the universal theme of ensuring a ‘greener environment’, the Audit Office acquired and implemented audit management software (TeamMate AMS), which is also an enhancement of its auditing processes. He said that the use of this software will see work done in an electronic environment, thereby reducing the necessity and production of working papers and reports using paper, thereby assisting in safeguarding the environment. Sharma said that the use of the software also ensures that work will be executed in a consistent manner using procedures and practices that are in compliance with international standards. “The use of this software marks the commencement of the Audit Office’s goal of automating the operations of its core functions, which is primarily the planning, execution and reporting on the audits of the Public Accounts of Guyana. Sharma also indicated that proceeds from the four IDB/GOG Technical Cooperation Agreements were also used to build capacity and capabilities in areas such as report writing, forensic accounting and fraud investigations, and performance, information technology and procurement auditing, which are aimed at producing work of a high quality on a sustained basis. In addition, assistance was provided to employees who pursued professional qualifications. The Office currently has in its employ two Civil Engineers, three Certified Accountants, four MBA Graduates as well as a Certified Fraud examiner. Sharma said that these initiatives are in keeping with the Office’s objectives to recruit and retain the best qualified staff, which filters to the production of high quality work. Further, Sharma said, that the Audit Office was able to increase its visibility and improve collaboration with some of its key stakeholders, including those in the hinterland where communication mediums are limited or even non-existent. “Looking forward, the Audit Office of Guyana will pursue the full implementation of the TeamMate Audit Management Software, thereby executing its core functions holistically in an electronic environment.